Keep your eyes open for the first ever Adams Center semester review, Teaching and Learning at ACU. The report includes information on our ongoing series, Art of Teaching, Science of Learning and Teaching with Technology. It also has our faculty spotlight stories, highlights from the fall semester and a glance at what’s coming up in spring and summer ’13. Come enjoy Christmas cookies, cocoa, and cider, and celebrate the holidays with your fellow faculty members. A drawing for door prizes will be held for all who RSVP, so make sure you call ext. 2455 or email your reservation today! On Friday, November 9, Dr. Richard Beck, ACU Mobile Research Fellow and chair of ACU’s Department of Psychology, will present groundbreaking research on the cognitive effects of social networking and how it relates to spirituality. Beck will share his findings concerning technology’s influence on faith, “Facebook fasting,” the “phantom phone vibration phenomenon,” and other topics. His research is tied to ACU’s Mobile Learning Initiative. The peer-to-peer presentation will take place in the Adams Center classroom in the Brown Library from noon to 12:50 p.m., with a faculty luncheon to precede the presentation at 11:30 a.m.
Beck, along with two psychology graduate students, Anne Briggs and Mary Tomkins, surveyed 313 undergraduate students at ACU about their social networking habits and how those habits affect their perceived spirituality, their relationship with God, and their faith overall. The research also surveyed various ways students have attempted to limit or moderate their use of social networking to mitigate its impact on their spiritual lives. For example, 53% of the students in the survey report having undertaken a “Facebook fast,” where they stopped checking or logging onto Facebook for a specified period of time. Beck also assessed a phenomenon researchers have dubbed “phantom phone vibration,” the experience of thinking your iPhone is buzzing in your pocket, only to find out it isn’t. “Eight-nine percent of our students reported having experienced phantom phone vibrations,” says Beck. “Of these, 38% of our students have this experience every day or every week.” According to Beck, the experience suggests we have become hyper-vigilant in monitoring our cell phones. The ACU Mobile Learning Initiative is built upon the theory that humans learn best when they are in community – collaborating with others in a learning environment without boundaries. A technological solution that aims at increased learning must enhance communication and convergence. Mobile Learning at ACU seeks to connect learners through engaged, collaborative, distributive, integrated, and evaluative models, all of which combine to produce a profoundly connected learning experience. For many students at ACU, service to the community has been an integral part of their college experience. Like any town, Abilene has plenty of people who just need a helping hand. A group of students in the Department of Art and Design, led by professor Brandon Young, have come up with a way to help out the best way they know how – by applying the skills learned in their classes. Through a project aptly titled Merge!, the students are trying to strengthen the bond between ACU and the community. Along the way they merged aspects of their design skills with a heart of service. 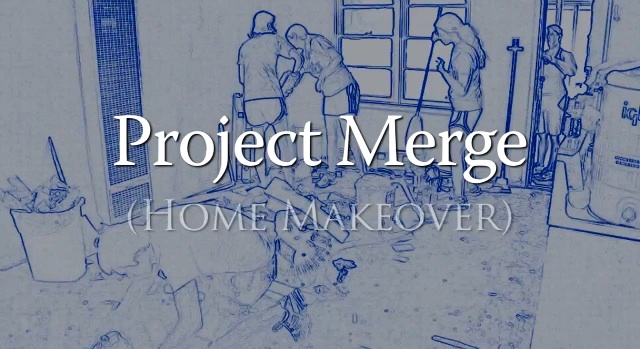 The students selected a local family in need and gave the family’s home a complete makeover. Haugaard, along with three of her fellow interior design majors headed up the project, with Haley Buffington of The Woodlands, Lisha Cottrill of Rockwall and Melanie Bartholomew of San Antonio playing vital leadership roles. The mission of the project caught on, with several local businesses and churches jumping on board to help, says Haley. For Kirsten, the project has been far more than just an opportunity to apply skills learned in her classes – it has helped focus her career goals in a mission-oriented sense. She hopes to one day do design work for those in need as a career and a ministry. “Projects like this are important because it is not merely “redecorating” or even redesigning a home, but the true significance behind it is to provide a warm, comfortable and loving home; everyone deserves that,” she says. Each year ACU names a handful of Mobile-Learning Fellows, ACU faculty selected through a competitive, peer-review process to examine a topic or issue relevant to the initiative. Dr. Bob McKelvain will study the science of cognition and the impact of digital literacy on the learning process. Dr. Stephen Baldridge will expand his explorations of the use of mobile devices and social media to facilitate significant increases in learning outcomes. Professor Kenny Jones will continue to look at augmented reality relative to enhancing art student performance and assessment capabilities. Dr. Cynthia Powell’s collaborative iPad project will focus on authoring and use of a general science iBook for pre-service elementary school teachers. Dr. Richard Beck will study the addictions of connectivity: psychological correlations of iPhone and Facebook usage. Drs. Ian Shepherd and Brent Reeves’ look at Mobile Data Mining Surveys will focus on pattern analysis and process automation. Dr. Melinda Thompson will examine the effects of digital literacy and technology on the spirituality of face-to-face and online students. Findings from ACU’s 2011-12 Mobile-Learning Fellows are expected in early June. Early results reveal mobile devices in science labs provides greater learning outcomes; mobile use in the arts provides unique opportunity for assessment; and use of tablets affords students unique collaboration opportunities. “Mobile learning is changing higher education,” said Dr. Scott E. Hamm, Director of mobile- learning research in ACU’s Adams Center for Teaching & Learning. “ We are in a unique place where we are transitioning from the devices that have ushered in these new opportunities to the digital literacies they have afforded us.” This year, ACU will continue our robust research agenda exploring spirituality and technology in ways that will guide us in equipping our faculty and students to develop effective habits for incorporation into their classes and daily lives. The Effect of Clickers in University Science Courses, a paper written by Dr. Autumn Sutherlin, has been accepted for publication in the Journal of Science Education and Technology partly based on her work as a Mobile Learning fellow (2010-2012). In four studies on the use of student response systems, clickers, we sought to understand whether the use of clickers would impact students’ attitudes toward the use of technology for instruction and achievement on exams. While the results varied some by study, overall, the results revealed no significant changes in the already positive student attitude toward the use of instructional technology. In all four studies, the majority of the students reported that they learned more when clickers were used in class. The use of clickers did not serve as useful predictor of student achievement in science classes. The findings of this study are similar to others which suggest that some classroom technologies (like clickers) may not necessarily have a direct connection with student achievement, despite positive student feedback regarding their experience using these technologies. Further studies are needed to better understand the true nature of relationship between these technologies and classroom outcomes. The Teaching With Technology series will provide faculty members with the opportunity to share tips and ideas for using technology in teaching and provide hands-on practice with a variety of tools. Sessions will be offered at all levels of expertise, targeting everyone from beginners to advanced users of technology both in and outside of the classroom. Join Houston Heflin at his session, Teaching with the iPad, on Monday, October 8th. Nathan Driskell and Mat Bardwell are continuing this series on Wednesday, October 10th, with Introducing iBooks Author. The Art of Teaching Series provides opportunities for faculty members to explore empirically based teaching techniques in an encouraging environment. Practical, hands-on strategies and a community of support offer faculty members the chance to get small group and one-on-one consultation and feedback as they put new teaching strategies into practice. Dr. Jennifer Shewmaker and Dr. Mindi Thompson will kick off this series with their session, Adventures in Teaching, on Tuesday, October 2nd. The Science of Learning series explores current research in the fields of learning, creativity, motivation, and measurement of learning relevant to teaching and course design. This series continues from last year and resumes on Wednesday, October 3rd with Dr. Bob McKelvain’s session, Designing lectures that work in working memory: Ideas about how to lecture so that students’ working memory can keep up. Connect with the Adams Center on Facebook or follow us on Twitter for the most current dates and information on the SOL series!